The Dishes: Already a household word! Suburban Toronto, 1975: A wasteland of muscle cars, his ‘n’ hers shag hairdos, and homegrown heavy metalists Rush, Max Webster, and Triumph. In this cultural void, Scott Davey and Tony Malone form a band that is the complete antithesis of the music numbing local FM airwaves. They dub their band the Dishes. In February 1976, the Dishes — who now also number Murray Ball on vocals, Michael Lacroix on saxophone, Ken Farr on bass, and Steven Davey on drums — begin a weekly residency at the Beverley Tavern, a seedy dive on the then far-from-fashionable Queen West that doubles as a watering hole for nearby Ontario College of Art students and faculty. With their strong visual image coupling short hair ‘n’ uniforms and original material that owes to similar intelligent art-rock pioneers Roxy Music, David Bowie, and the Kinks, the Dishes are an immediate sensation with Toronto’s burgeoning avant-garde art scene. The Dishes’ success inspires their audience of frustrated musicians and artists to start their own bands. Within a year of the Dishes’ debut, the Diodes, Martha and the Muffins, the Cads, the Curse, Johnny and the G-Rays, the Government, and the Viletones — as well as countless others — follow in the Dishes’ steps. Even more significantly, the Dishes’ Beverley gigs kick-start the about-to-be-hip strip’s scene of cool clubs, art galleries, and trendy eateries. In May 1977, the Dishes release their EP Fashion Plates on their own Regular Records, the first independent release by a Canadian band. It sells 4,000 copies. By now, 18 year-old Glenn Schellenberg has joined the band on keyboards. Next, the Dishes’ focus on finding a larger audience. They work with performance artist David Buchan on two shows — Geek Chic at the King Edward Hotel Ballroom and Fashion Burn at Crash ‘n’ Burn — as well as a perform in a show called Hot Property: the 1984 Miss General Idea Pageant with international art stars General Idea at the Winnipeg Art Gallery. The Dishes also become a regular opening act for Carole Pope and Rough Trade, Toronto’s other hottest property. At year end, TVOntario records the Dishes in concert for its program Night Music, and broadcast it over 20 times. Early 1978 sees the release of the Dishes second EP — Hot Property, with cover art by General Idea — and the band’s return to the Beverley for a series of standing-room-only appearances. They also appear with Talking Heads at the re-born Horseshoe Tavern that spring. 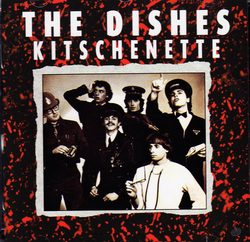 Although the Dishes break up soon afterwards, their influence on Toronto’s burgeoning punk/new wave scene continues long after their demise. Not only do the Dishes define the Queen West scene, they open the door for every combo that follows in their wake. Kitschenette: The Best of the Dishes documents this pop art history. Murray Ball was the cook at the landmark Peter Pan restaurant on Toronto's Queen West when it opened in 1976. He later launched the Fiesta Restaurant in Toronto's Yorkville with General Idea muse Sandy Stagg in 1979. He sold the Fiesta in 1987 to open Toronto's premier dance and concert venue RPM (now the Government/Kool Haus). He followed with Whiskey Saigon, the multi-level dance club in Toronto's Entertainment District. Scott Davey joined Sherry Kean's band the Sharks after leaving the Dishes and recorded an LP with them in 1980. He also sings on the Rough Trade hit Crimes Of Passion. He currently runs his family's book distribution company. Steven Davey started the Everglades with electronic guitar-star Michael Brook and the Dishes' Glenn Schellenberg. The band's biggest claim to fame was their two songs on Bomb Records' The Last Pogo (I'm In A Coma, Rock 'n' Roll Cliche). Davey also wrote "Rebel Unorthodox," the B-side to the Viletones' first single Screaming Fist. He was also a rock critic for the Toronto Star (1976 to 1978), and has written for Creem, Xtra, and Macleans magazine among others. In the early 80s, he formed Hoi Polloi with the Demics' Keith Whittaker. He's currently the food editor and restaurant critic for NOW magazine, and the author of the NOW CityGuide to Toronto (McClelland & Stewart). Ken Farr went on to play bass for Tony Malone's Drastic Measures before retiring to academia. He is the author of 'Trees In Canada'. Michael Lacroix lives in Guelph and mixes sound for film and television projects. Glenn Schellenberg followed his stints with the Dishes and the Everglades by forming the electronic combo TBA with Andrew Zealley. Their single Hands Across The Nation was a popular favourite on CFNY. He is currently a professor of psychology at the University of Toronto.